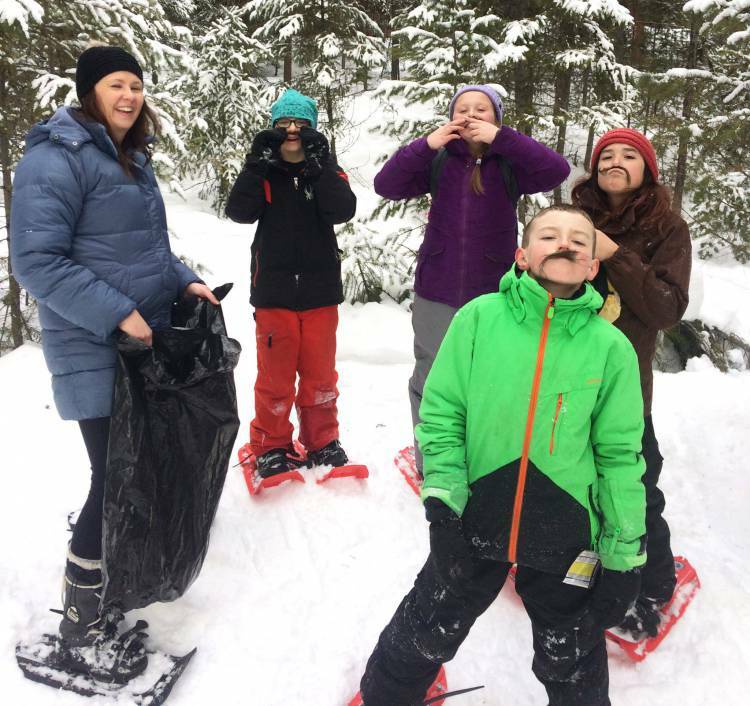 Earlier this month, Kimberley students in Mrs Strachan-Garrel’s Grade 4/5 class at McKim Middle School put on snowshoes and went out into the snow to harvest lichen for our endangered mountain caribou. Patty Kolisnichenko, a local educator who leads EcoStewards, Wildsight’s stewardship-based education program for kids, visited the class several times to teach the students about ecosystems, food webs, mountain caribou and their role in protecting our inland temperate rainforest—the only one in the world! Before heading out to gather lichen, the students were also treated to a visit by local biologist Dave Quinn, who has worked extensively on our Mountain Caribou Recovery Project. The class spent the morning at Camp Stone harvesting lichen. The lichen will be fed to mountain caribou cows from the struggling South Selkirks herd after they’re placed in a maternity pen this spring. The maternity pen will give them a safe place for the cows to give birth and for the calves to get their feet under them in the dangerous first few weeks of their lives, safe from predators. There are roughly 12 animals left in the herd. The students also played games to help them understand the predator/prey relationship and learn about how healthy forests help protect and provide habitat for caribou and many other amazing organisms. The students helped dry the lichen and delivered it to Wildsight’s Executive Director, Robyn Duncan, who will send it off to the maternity pen. As a final wrap-up, students made posters to share what they learned about mountain caribou and the importance of wild spaces and intact ecosystems with their school.